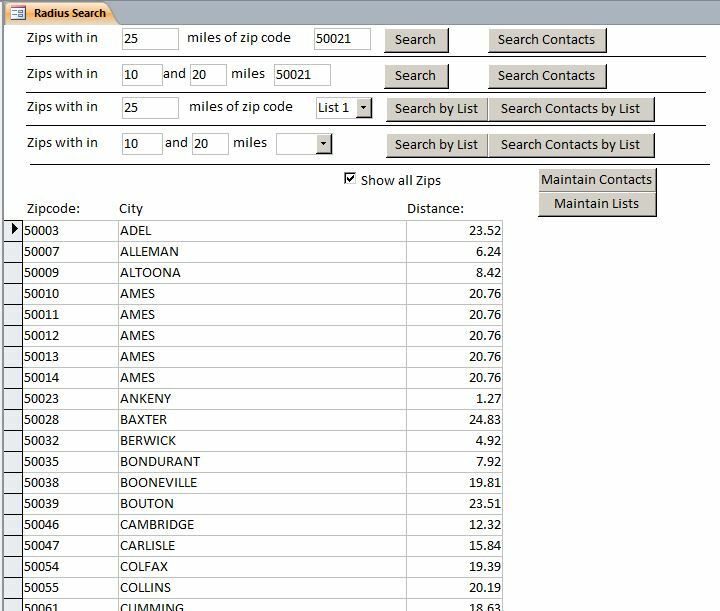 The Microsoft Access Zip Code Radius Database is a full featured database that allows a user to input a zip code, input a number of miles from that zip code and return all zip codes that fit the criteria. This template database also show how you could use this feature to integrate it into your customer/contact list and return customers/contacts that fit the criteria you specify. The template database also shows you how to use a list of zip codes to perform the same functions. Want a UK version of this database - then be sure and check out the Microsoft Access Postal Code Radius Database here. Download a demo version for free to try out. The demo version is in Access 2007 which will work on either Access 2007, 2010, 2013 or 2016. If you need a previous version of Access to tryout, please Contact Us. Please note that the demo version of the software is fully functional, but only includes a small subset of zip codes - the full version of the software available for purchase has a complete list of US zip codes. $24.99 for your internal use - this allows you to use this database template however you wish within your organization. $49.99 for unlimited developer use - this allows you to use this database template however you wish for any applications you develop and distribute.